Bought 3 shares of 3M! Three shares seems insignificant, but after the sale of my Modern Warfare Motif I wanted to reinvest the money into 2-4 companies with a history of raising dividends. I purchased 3 shares of 3M Company on 3/9/16 for $160.59 a share. 3M (MMM) was founded in 1902 and was formerly known as the Minnesota Mining and Manufacturing company. In 2002, it began going by the name 3M Company. It is a conglomerate based out of Minnesota. Industrials - Includes items such as manufacturing products for automobiles, electronics, packaging, food and beverages, and more. Safety and Graphics Business - Major items in this segment include traffic safety and security items as well as reflective material used in construction work zones. Health Care - Provide medical and surgical supplies to clinics, hospitals, pharmaceuticals, and dental practitioners. Also, manufacture medical tapes, dressings, wound closing products, etc for surgical needs. Electronics and Energy - Provides products for LCD computers, televisions, cellphones, tablets, notebooks, and automotive displays. Consumer - This is the area we are all familiar with including Scotch and Post-it branded items. The list above shows just some of the areas and items 3M is involved in, but clearly it is involved in five business segments which are all part of our daily lives. No single segment accounts for over 35% of the business sales and the lowest is the Consumer segment, which brings in 14.6% of net sales. 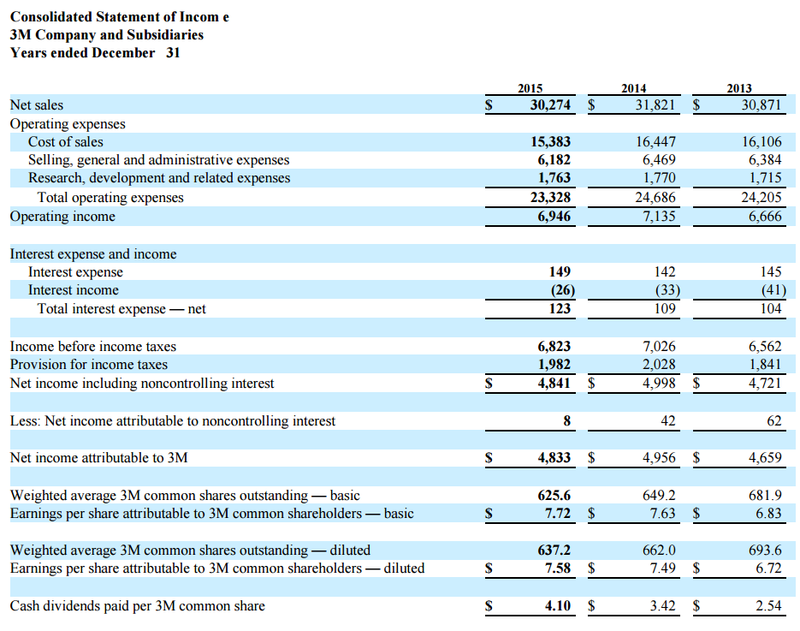 $12 billion of the net sales were in the US accounting for 39.8% of worldwide sales. Net Sales internationally equaled $18.2 billion or 60.2% of the worldwide net sales. Cash flow decreased by $206 million partially due to $363 million in higher cash income taxes compared to 2014 and lower net income. Cash dividends increased from $3.42 last year to $4.10 a share in 2015. The company has paid a dividend for the past 98 years and have increased the annual dividend for 57 consecutive years. Clearly, they are committed to a growing dividend! 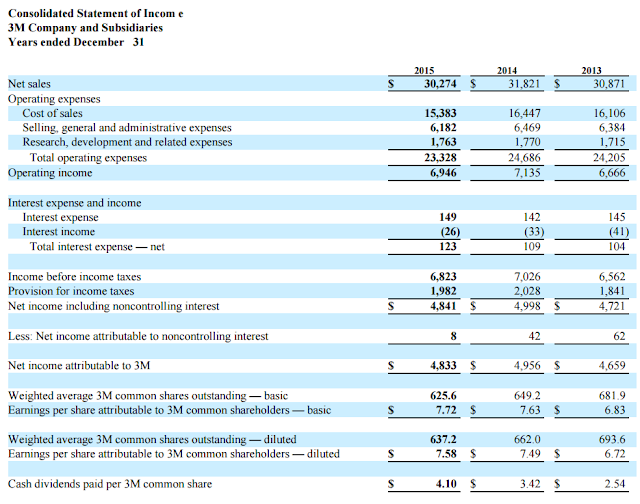 Overall net income decreased from the financials above, but due to a strong share buyback program the average shares outstanding dropped resulting in a higher diluted earnings per share amount. It yields 2.74% and adds $13.32 of annual dividend income to my portfolio, on its current $1.11 quarterly dividend. Taking a second look at everything maybe I should have waited for a pullback. However, I know I am moving in the right direction now. What do you think of this company? Do you own 3M? What usually signals you to buy a stock? 3M is probably one of the best long stocks your money could buy. Whether it's a recession, a solid dividend payment, or just a bragging tool to have in your portfolio, you can't go wrong with MMM. In the current market you couldn't have grabbed much else at a discount so you did well by snatching them up when you did. Thank you - that is what I am hoping for. Long term I know this is a great investment. You have quite a good start to your portfolio. Like you I am hitting the 'restart'button. I have added you to my blogroll and hope to follow your journey.